Looking to finance your energy-saving project? The company not only designs, manufactures and installs, but also commissions and maintains integrated energy management systems for the control of electrical equipment in buildings, including lighting and power, heating, ventilation and air conditioning. As one of the largest systems integrators in the South West for Cylon, Trend and TAC, we are able to provide a tailor-made solution for many different applications. The technical design of Unique 5 enables us to offer a range of deployment options to suit your IT infrastructure and business needs. Self Service - Full network deployment – All elements of the Unique 5 software and databases are installed on your IT network by us, giving you complete security and control. Hosted Service – The Unique 5 server software and database are installed on our secure server, with just the Unique 5 client software installed on your PCs. This can save you some hardware and upgrade costs, but also provide you with the peace of mind of full support and backup. Full Bureau Service – The Unique 5 software is installed and operated by highly experienced personnel in our Technical Support Centre, who will monitor your systems and provide you with just the information and reporting you require. Unique 5 energy reporting gives you a clear view of your energy and resource usage. Taking data from a variety of sources including modbus and pulse meters, and databases attached to major BEMS manufacturers, Unique 5 collates and presents this data clearly and flexibly, enabling you to identify and target reductions in your energy usage. CO2, cost and tariff information can also be displayed, along with powerful baselining features which enable you to see just the exceptions to your expected energy and resource usage. Reports can be run on demand or automated and delivered by email to your desktop. Our years of experience in operating event logging and tracking for hundreds of sites on behalf of our blue chip customers have resulted in a system which has been proven in ‘real world’ situations. Unique 5 Event Logging is available for use within your organisation, providing your facilities and maintenance team with a powerful tool to quickly record issues and ensure they are resolved even before staff or customers notice. Full reporting enables easy management of outstanding issues and identification of maintenance needs, avoiding potentially costly stoppages. Unique 5 is totally transparent to you and to our bureau staff. The bureau is managed by experienced staff and supported by fully qualified engineers. Alarms can be configured to generate email alerts to enable proactive handling of faults of standard or even critical plant. This can be monitored, linked and managed by our bureau, by your staff, jointly or with emergency response personnel. The system is totally flexible and can accommodate multi communication channels. With sensitive operations, this rapid response monitoring is critical and can save time and lost revenue by reducing plant downtime. Unique 5 really is unique, not only can it remotely monitor the activity, performance and efficiency of each piece of your equipment, it can also control it from a distance! It can allow you to predetermine the degree of control you allow local users to have over a piece of equipment, a room, floor area, building or an entire estate. It is that configurable it can re-route malfunctioning controllers to another controller. So whether you want to control timing, temperature, performance or access Unique 5 is able to provide you with that flexibility, security, control and peace of mind. Unique 5 provides you with the ability to link asset registers, site details, site plans and electrical diagrams, energy monitoring and other functions in a single system. Our seamless interfaces to existing market leading BEMS enable you to view asset details without installing and running multiple applications. We also provide personal support which may include making adjustments to lighting and heating/air conditioning temperature controls. This may be to accommodate early opening hours, bank holidays and requests from individual stores, offices or industrial units. Many BEMS claim to be proactively interactive, but in truth, they are simply measuring and monitoring systems which, whilst they do give accurate and useful data to the company, tend only to have an impact in the short term. From our experience, the people charged with managing energy do not have the time to sift through every report generated by all of the sites under their control and then act upon the information they receive. Group, cluster or site comparisons and alarms can be preset to trigger activity once upper or lower control limits have been reached, ensuring that managers are informed when they need to intervene. Our flexible options give you the opportunity to choose the level of involvement you require to achieve the control to manage your office, factory, farm, school or building more cost effectively. You have more tools/resources at your disposal to manage your areas of responsibility and to reach your energy consumption targets. Despite the fine words…ultimately, there are really only two reasons to reduce your energy consumption – saving money and saving the planet. However, governments, public institutions, corporations and even smaller companies are looking for savings and certainly finance directors and shareholders will also be pushing for ways to reduce costs even further, so in a time of global financial uncertainty and limited energy provision implementing Unique 5 must be the most prudent way forward. Energy suppliers are all tasked by the Government with reducing the energy consumption of their biggest users, so by working closely with your energy supplier and also implementing Unique 5, perhaps more favourable rates can be obtained. Initiatives such as the Carbon Reduction Commitment (CRC) are implementing real financial costs to business energy usage, even beyond the unit cost itself. Green credentials are also becoming increasingly important in the supply of government agencies. Governments across the world are taking initiatives to penalise excessive energy usage and reward efforts to reduce the environmental impact of business. Whatever the effect of these moves, there is no doubt that environmental credentials are a real and growing factor in running a successful business in the UK. Our protocols have been designed to talk to the leading air conditioning equipment manufacturers including Mitsubishi, Daikin, Toshiba, Sanyo, Lennox, York, Trane and many others, which now enables precise identification of faults, allowing maintenance engineers to be armed with the exact parts to make the repair, once again saving time, money and indeed, downtime of plant and/or equipment. Plant failures are notified to the host as soon as they occur, enabling planned repair and maintenance to be undertaken, generally before the client is aware of faults. Our remote monitoring and control Technical Support Centre service is available. This uses wireless technology, computer terminals and ISDN lines, TCP/IP, GPRS and GSM connectivity to keep watch on the systems at each site. In this way we can ensure services are performing safely and with maximum energy efficiency. Unique 5 offers you the power of information which enables you to save energy. Our reports provide specific ‘realtime’ information about how you are using power - which sites are using the most, which times of day power is highest, and which individual electrical units are having an effect on your energy usage. With this information, you can take action to streamline your energy usage, and you'll have documented evidence of usage to convince your colleagues and shareholders that real savings are being made. The CRC has forced businesses to think very seriously about energy efficiency. 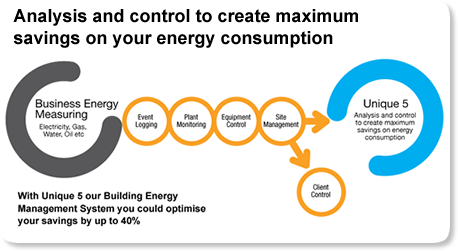 Our building energy management systems can help companies to minimise the impact of this levy by using our Unique 5 energy management tool to highlight energy consumption and check bills. Our customers typically save between 20-40% on their energy costs. With more information at your fingertips and better control of your energy, you can reduce costs by eliminating waste, improving maintenance and meeting government regulations. Consumption of oil, gas and water is also easily measured, monitored and controlled to provide a complete package. Public awareness of the environmental question has intensified over the last few years, with media reporting more confident of the effects of global warming. Green consumer choices have increased and the public, including your customers, expects businesses to take the lead in creating a more sustainable future. Investment in energy management systems will provide its own financial benefit, but will also provide real proof to the public that you are investing in a greener future, improving your brand and customer perception. Beyond the benefits in cost savings and public relations, business owners and managers across the UK are becoming more aware and concerned about the impact of their production on the environment. Our energy management systems allow you to improve your green credentials without adversely affecting productivity or cost. Energy conservation doesn't have to mean going without, but can be achieved with a more efficient approach to energy, which will also save you money, but perhaps on a personal basis – give you peace of mind. Some of the clients that have so far discovered the benefits of this approach to energy management and are capitalising on it include Boots, Russell & Bromley, Argos, Homebase, Choice, Best Buy and many others. For one major UK retail client, Severn Controls has installed energy management control systems in some 460 stores to date. Each store's system is controlled remotely from our own monitoring centre. Heating, air conditioning and lighting are adjusted to maintain ideal working conditions and a pleasant ambience for customers, whilst keeping energy usage to a minimum. The system also incorporates time clock adjustments for exceptional trading times etc., e.g. bank holidays and sale days. Building energy management systems installed by Severn Controls at Delphi’s Stonehouse factory and offices have greatly reduced maintenance, cutting energy usage by as much as 30% and correspondingly reducing the Carbon Fuel Levy Charge payable by the company.